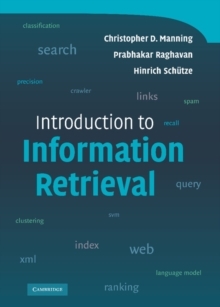 Class-tested and coherent, this textbook teaches classical and web information retrieval, including web search and the related areas of text classification and text clustering from basic concepts. It gives an up-to-date treatment of all aspects of the design and implementation of systems for gathering, indexing, and searching documents; methods for evaluating systems; and an introduction to the use of machine learning methods on text collections. All the important ideas are explained using examples and figures, making it perfect for introductory courses in information retrieval for advanced undergraduates and graduate students in computer science. Based on feedback from extensive classroom experience, the book has been carefully structured in order to make teaching more natural and effective. Slides and additional exercises (with solutions for lecturers) are also available through the book's supporting website to help course instructors prepare their lectures.